TrichoSym Bio is a biological product developed in an aqueous medium, which keep stable at room temperature and offers beneficial effects to crops. TrichoSym Bio can grow saprophytically on organic matter in the soil as well as on the roots of plants and produces natural substances which solubilizes phosphates in the soil and makes them available to the plant increasing root volume and promote the growth of plants. TrichoSym Bio is a biological product based on a naturally occurring fungi Trichoderma harzianum. The specific strain, T78, has been molecular characterized and is deposited in the Spanish Collection of Type Cultures. Trichosym Bio contains a minimum of 5 x 1011 cfu (colony forming units) per liter of product. – Its application increases the solubility of nutrients as well as the nutrient uptake capacity of the root and/or their distribution within plant parts. – Trichoderma harzianum T78 help plants better resist environmental stresses such as salinity and drought via reinforcing plant growth. – The fungal mycelium secretes different compounds that increase the branching capacity of the root system, thus improving nutrient and water acquisition. TrichoSym Bio is recommended for any kind of horticultural crops. Soil application: apply 15 days after transplant with a rate of 0.20 gallons/acre. Repeat in 30 days with a dose of 0.10 gallons/acre. It is highly recommended to apply for 7 days after inoculation of arbuscular mycorrhizal fungi to avoid the competition. TrichoSym Bio may be applied by through and irrigation system or by root dipping. Take care of other residual products do not remain in the irrigation system before application. The application system should be thoroughly cleaned after use. Drip irrigation systems must be cleaned by adding one or more drip irrigations during the day of (but not directly after) application of Trichosym Bio . Seedbed: 0.025 gallons per 250 gallons of substrate. 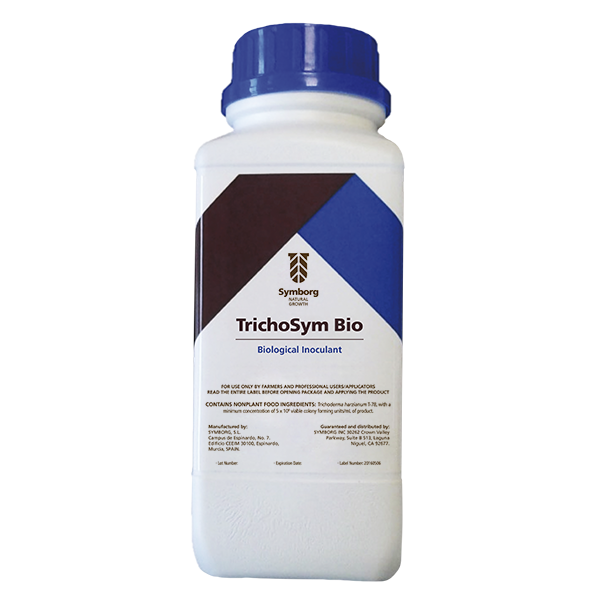 TrichoSym Bio is compatible with most of the soil-applied fungicides placed on the market currently. TrichoSym Bio should be stored at room temperature until 12 months. For longer period, store in a cold dry place at 4 ºC. Keep in its original packaging. When handling and applying protective clothing, gloves and face masks should be worn. Wash hands after use. Keep out of reach of children and animals. Do not store near food or feed.